I've been promising to take some baked goodies into work for ages so decided a Random Bake of Kindness was in order. I had the oven on anyway so it was easy to make a little extra. I started by making some Millies Style Double Chocolate Chip cookies. They are always a crowd pleaser and very quick and easy to make. I forgot to take any photos but it is the same recipe as my very first post and there are photos there if anyone wants to take a look. The full recipe is below but basically you cream the butter and sugars together, add an egg and then add flour, cocoa powder, salt and chocolate chips. I always chop a bar of chocolate up as I prefer chunks to the small drops. I also tend to use white as I like the contrasting colour, but any chocolate works or even nuts, raisins or chunks of toffee. Bake them in an oven pre-heated to 180C for 7 mins before cooling on a wire rack. Don't be tempted to cook them for any longer if you want the lively chewy middle. Even if you don't think they're done I promise they will firm up! Once cool either serve as they are or drizzle with a little melted chocolate. I also wanted to take a cake, but wanted to try a new recipe. Here in the UK there is definitely an autumnal feeling in the air. The nights are drawing in, the weather is getting colder and the leaves are falling from the trees. This time of year always makes me think of spices and warming flavours so it is the perfect time to try a recipe I've fancied making for a while. It's a Spiced Apple Cake with Brown Sugar Frosting and is adapted from the Hummingbird Bakery Cake Days recipe book and also used some of the many apples I have waiting to be used. The full recipe is below but you start by cooking the grated apple, sugar, spices and apple juice in a pan. While it cools a little cream the sugar and butter until light and fluffy. Add the eggs one at a time followed by half of the dry ingredients the soured cream and the rest of the dry ingredients. Finally mix in the apple mixture and the walnuts. Put the mixture into two 8'' tins. Make sure they are lined and greased especially well as I found the cakes very sticky once baked. Bake for about 30 mins until a skewer pushed into the middle comes out clean. Cool on a wire rack. I found the cakes to be very sticky and crumbly so handle them carefully. In the meantime make the icing. Put the egg whites and sugar in a heat proof bowl (make sure the bowl is scrupulously clean and no yolk sneaks in otherwise the whites will not whip) and place over a pan of water, taking care that the bowl doesn't touch the water. Whisk on a high speed for about 8 mins until the mixture forms stiff peaks and allow to cool for about an hour. Once everything is cool sandwich the two cakes with approximately 4 tablespoons of icing and use the rest to cover the top and sides of the cake. It was a really unusual cake and everyone was very complimentary. 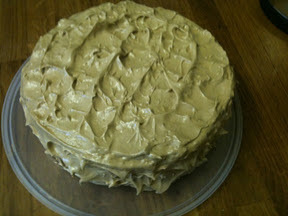 Especially about the icing which was very yummy! take out of oven & leave for 1 min before transferring to wire rack. 8. Make the icing by mixing the egg whites with the sugar in a heat proof bowl (ensure the bowl is scrupulously clean and no egg yolk gets in otherwise the eggs will not whip). 9. Place the bowl over a pan of water but make sure that the bowl doesnt touch the water. Whisk on a high speed for 6-8 minutes until it forms stiff peaks. Set aside to cool for about an hour. 10. Once cool place about 4 tbsp of icing onto one cake and then sandwich the other on top. Use the remainder of the icing to cover the top and sides of the cake.